First access to the free spa and discount on the first massage. We provide free Wi-Fi in all hotel rooms as in common spaces. Your vacation, at the lowest price guaranteed! Book now your stay through our official website and benefit from the best guaranteed online price, without extra costs or hidden commissions and with the maximum confidence and the best possible customer service. Do not let them to tell you! We are waiting for you. The hotel protects the data of its clients. When making the first reservation you will receive exclusive offers in your email with promotional codes for future reservations. Book now at the BEST RATES GUARANTEED! April, May and October there will be a special discount of 7 nights for the price of 6. Welcome to Els Pins Resort & Spa, our hotel in San Antonio Bay, Ibiza. The fully-refurbished Els Pins Resort & Spa hotel boasts everything you'll ever need to enjoy an incredible holiday in San Antonio Bay, Ibiza. With one of the best views of the Mediterranean Sea, our hotel has all the facilities, amenities and services you'll ever wish for. Specially designed for couples and families, it's the ideal resort for relaxation and wellness. Luxuriate in our spacious spa and wellness centre, with an array of treatments, massage services and a gym. Enjoy a privileged setting, with many tourist attractions just a stone's throw away. Savour the most exquisite local and international cuisine at our bars and restaurants. Welcome to the holiday you truly deserve! Els Pins Resort & Spa hotel has 224 fully-equipped rooms (family rooms, suites, deluxe rooms, etc. ), with capacity for up to 4 people and many of them with stunning sea views, which include all the facilities and amenities to guarantee your utmost relaxation and well-being: telephone, television, air conditioning, minibar, bathroom with shower and hairdryer, safe, and so on. What's more, the complex boasts two restaurants: the main one is buffet style, with open kitchen dining and featuring Mediterranean dishes at lunch and dinner; while the second one is a gourmet restaurant with a tasting menu and an à la carte option, serving typical Mediterranean cuisine. We also have two bars, one by the pool and the other in the hotel lobby. We'll delight your taste buds! Free high-speed WiFi is provided throughout the resort. For the benefit of adults and kids alike, the hotel lays on multilingual entertainment and activities, both day and night. Whether on a room-only, bed and breakfast, half-board, full-board or all-inclusive board basis, this is the ideal hotel for the entire family. The Els Pins Resort & Spa hotel is located in a privileged setting. It has direct access to the sea, just 20 metres away. Approximately 150 metres away are an array of bars, restaurants and other attractions. 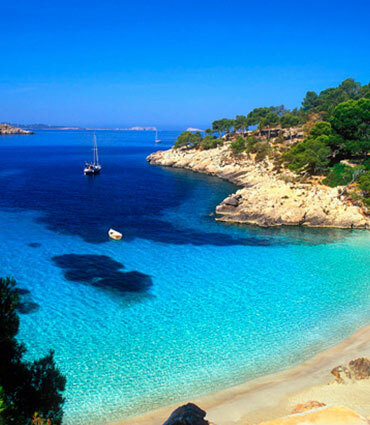 The heart of San Antonio is just 3 kilometres away, while Ibiza Airport is only 19 kilometres away. This strategic location means you can enjoy all the facets of tourism in Ibiza: heavenly beaches and coves with crystal-clear waters and fine sands; a multitude of enchanting villages and a rich cultural heritage; an array of daytime entertainment and nightlife, such as hippie markets, bars, restaurants, pubs and beach clubs; and - of course - a host of world-renowned clubs. Your holiday at the lowest rates guaranteed! Book your stay now on our official website and benefit from the best guaranteed online rates, without extra surcharges or hidden fees and with the maximum confidence and the best possible customer service. Don't leave it for others to tell you about it! We can’t wait to meet you! 5% of Discount in the case of reservations made for 2019. I wish to receive news and offers from the Emar Hotels group. Sí, deseo recibir las comunicaciones sobre ofertas y promociones y acepto la nota legal y la politica de privacidad de la web.